Once again prepaid refill cards are on sale at Target. This time the retail store is offering buy one get one for 20% off. Not all brands that the store carries are part of the sale. 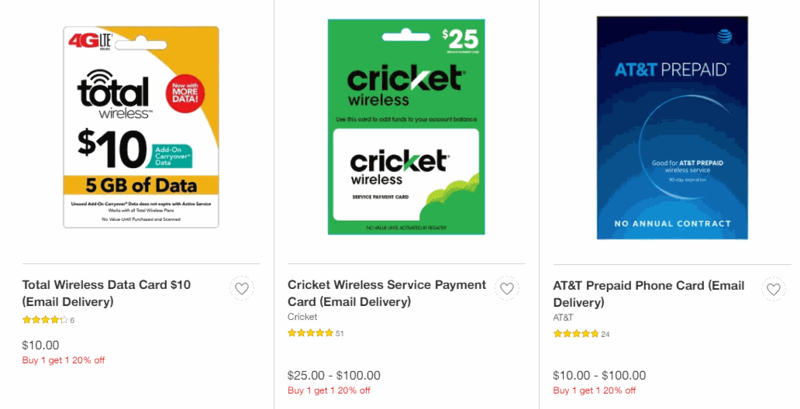 Brands that are a part of the sale include AT&T Prepaid, Cricket Wireless, Net10, Simple Mobile, Tracfone, and Total Wireless. Here are the refill cards that are currently on sale with their BOGO discounted prices shown. Bonus offer, get a $20 gift card when you purchase a 16GB AT&T Prepaid Samsung Galaxy Express Prime 3 for $99 with an airtime card. The sale is scheduled to last until 1/19/2019 at 11:59 PM local time. If you use a Target REDcard you can save an additional 5% on your order. A Target REDcard can either be a debit card from Target that is linked to your bank account or a credit card. REDcard members also get free 2-day shipping and extended returns of 30 days. REDcard members also get discounts on specialty gift cards and in other stores such as Starbucks.